This UHF custom RFID Jewelry tag is specially designed to enable automatic jewelry tracking in retail, wholesale or secured storage applications. The product section seeks details such as lot type, metal type, weight, making charges, wastage, stone type & its weight besides other details which are then stored for inventory process as & when required. To add value to the details fed into the database, RFIDJS deploys RFID system to tag individual items with defined item-based details in the Item Master section. The information thus fed in the counter section aids tracking the physical presence of the items in the showroom during the process of shelf inventory. To put in simple words, the captured image is displayed with all relevant information about the item in the display section when RFID system is activated. This module activates the RFID system and auto detects the tagged items and displays the relevant information of every individual item along with the image. About 30 different items in basins can be placed on the RFID reader and their information can be read simultaneously. Most of the earlier RFID tracking systems used the HF frequency, mostly because it is the more mature and readily available system at the time that these systems were deployed. Inventory can be taken multiple times throughout the day & one handheld reader can be used to support an entire store. Actual information such as the location of every jewellery piece, the trending on the number of times it has been requested over the counter and similar tracking duties are conscientiously performed by the system. 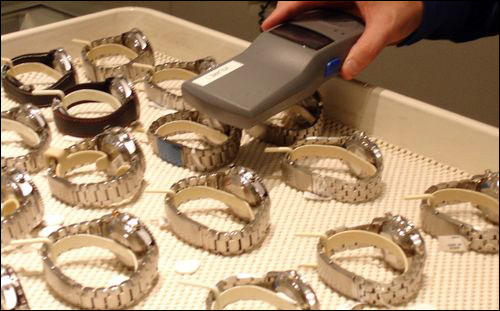 Jewellery software can be setup to continuously receive real-time report feeds from RFID readers and performs corresponding actions as required in the jewellery management process. For example, if a particular jewellery item is removed from the smart shelf unauthorized, the system can be programmed to alert the shop manager that a possible theft is taking place. These sleek looking tags are unobtrusive and ensure that the aesthetics of the jewellery items remain intact. Manufactured under the strictest quality processes, these tags weigh about 300 mg. with a tolerance of one percent. With a tiny hole, this compact custom RFID Jewelry is very flexible for fitting to the jewelry items. The increasing movement of adopting custom RFID Jewelry tag in jewelry segments, custom RFID Jewelry tag for jewelry list management applications, used in the retail, jewelry store, warehouse depot and protected container applications. The custom RFID Jewelry tag used to provide the help to gather data from hundreds or thousands of items in few estimated seconds.